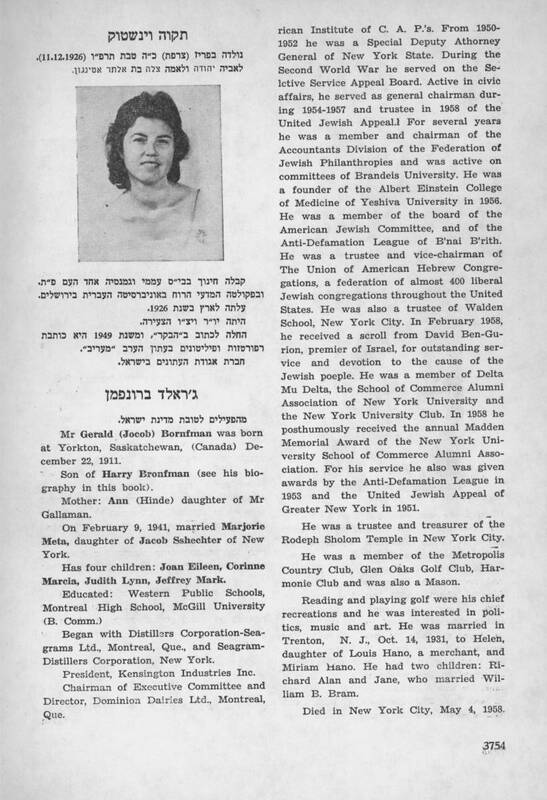 He was a trustee and treasurer of the Rodeph Sholom Temple in New York City. He was a member of the Metropolis Country Club, Glen Oaks Golf Club, Harmonie Club and was also a Mason. Reading and playing golf were his chief recreations and he was interested in politics, music and art. He was married in Trenton, N. J., Oct. 14, 1931, to Helen, daughter of Louis Hano, a merchant, and Miriam Hano. He had two children: Richard Alan and Jane, who married William B. Bram. נולדה בפריז (צרפת) כ"ה טבת תרפ"ו (11.12.1926). לאביה יהודה ולאמה צלה בת אלתר אטינגון. קבלה חינוך בבי"ס עממי וגמנסיה אחד העם פ''ת. ובפקולטה המדעי הרוח באוניברסיטה העברית בירושלים. החלה לכתוב ב"הבקר", ומשנת 1949 היא כותבת רפורטזות ופיליטונים בעתון הערב "מעריב". Son of Harry Bronfman )see his biography in this book(. Mother: Ann )Hinde( daughter of Mr Gallaman. On February 9, 1941, married Marjorie Meta, daughter of Jacob Sshechter of New York. Director, Dominion Dairies Ltd., Montreal, Que.